This article is a part of Morning Consult’s Most Admired Employers series. The full rankings are available here. When the oldest workers think about their favorite companies, they picture classic American brands that hark back to the country’s manufacturing golden days. 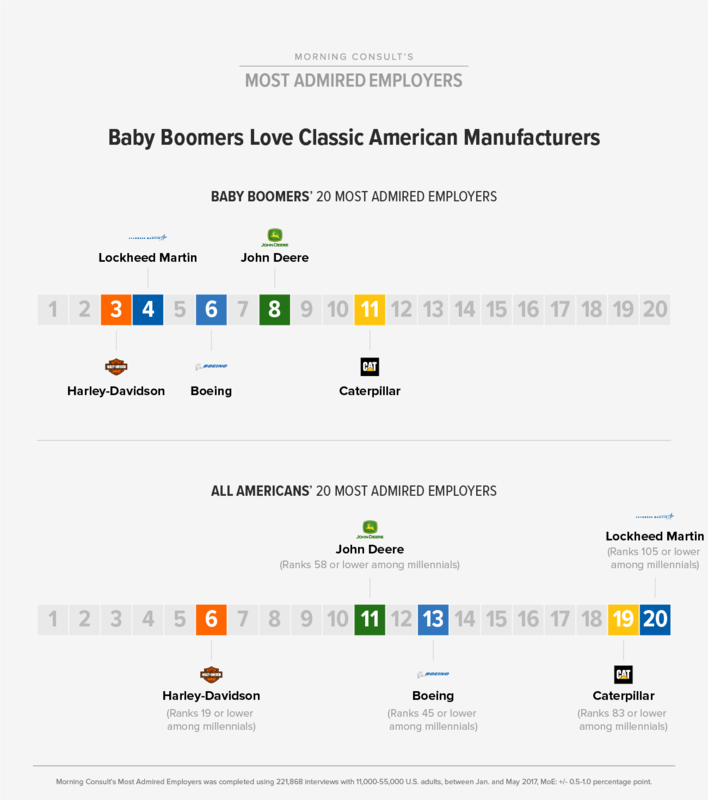 Baby boomers picked Harley-Davidson Inc., Lockheed Martin Corp., Boeing Co., John Deere (Deere & Co.) and Caterpillar Inc. among their most admired companies, ranking them higher compared to respondents from other generations, according to Morning Consult interviews with tens of thousands of U.S. adults between January and May. Respondents were asked if they would be proud to work for a company, and could say “yes” or leave the response blank. While people age 51 to 69 were almost as likely to admire Amazon.com Inc. and The Walt Disney Co. as other generations, they consistently were more likely than younger adults to give high marks to manufacturers. Harley-Davidson was ranked No. 3 by baby boomers, Lockheed Martin came in fourth and Boeing was sixth. Those three firms didn’t crack the top 10 for millennials. John Deere at No. 8 and Caterpillar at No. 11 rounded out the list of most admired companies for older workers, who disproportionately favored firms that manufacture items such as motorcycles, lawnmowers and planes. Caterpillar was ranked 82nd among millennials’ most admired companies. The results are in line with what Leon Grunberg, sociology professor emeritus at the University of Puget Sound in Washington state, found when he interviewed hundreds of Boeing employees for books he co-wrote about the company. He said that more than other generations, baby boomers really loved Boeing, despite workers saying the company was increasingly focused on financial results over innovation after it merged with rival McDonnell Douglas Corp. He said tradition likely played into baby boomers’ views of manufacturers. “They’re more tied to the past in that sense, and they’ve lived through experiences where Boeing and Caterpillar meant something,” Grunberg said. He noted that the “social welfare” model of a corporation was also important, where bigger manufacturers would hire workers for life and provide them with a decent standard of living — an especially important benefit for those without a college degree. “You’d give lifelong loyalty to a company and in return you got security for your life,” he said, adding that that social contract has disintegrated since the 1980s. Separate Morning Consult polling shows that baby boomers and those without a college degree were just as likely as other demographics to favor salary and job stability when asked about what factors matter most in working for a company. But both groups were more likely to prioritize benefits such as health insurance and a 401(k). Besides salary, 36 percent of baby boomers chose benefits as the top priority for picking a company. That figure fell to 30 percent for Gen Xers and 22 percent for millennials. The separate poll was conducted May 23-25 among 2,182 American adults and has a margin of error of plus or minus 2 percentage points. The companies mentioned in this article did not respond to requests for comment.